You can validate the data in the domain and post office databases at any time without interrupting normal GroupWise operation. The frequency can vary depending on the size of your system and the number of changes you make to users, resources, and distribution lists. Make sure you have full administrative rights to the domain and post office database directories you are validating. In ConsoleOne, browse to and select the Domain object or Post Office object where you want to validate the database. 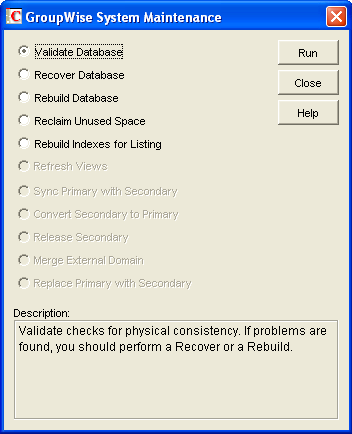 Click Validate Database > Run. You are notified if there are any physical problems, so you can then recover or rebuild the database. See Section 26.2, Recovering Domain or Post Office Databases and Section 26.3, Rebuilding Domain or Post Office Databases.